Ian Kelley’s plans for a simple life centering on one small donut shop quickly became complicated. After opening Sugar Shack Donuts in Richmond, Virginia, in 2013, he suddenly pulled in four times his projected revenue when the shop gained a following among foodies and landed on “best donut shop” lists. “I thought it was a one and done thing, then things got crazy,’’ said 32-year-old Kelley, who’s since expanded to 10 stores and is eyeing franchising by midsummer. Kelley’s success may be unique among small business owners, but despite some headwinds, they’re optimistic about their prospects. According to the 2017 Allstate/USA TODAY Small Business Barometer, America’s small business are in solid shape, with optimism surging well above last year’s level. The Barometer combines a survey of nearly 2,800 small business owners with federal data to create a comprehensive profile of the small business environment across the nation and in 25 of its largest cities. Optimism is particularly high in nine of those cities — Cleveland, Houston, Miami, Nashville, Orlando, Portland, St. Louis, Tampa and Washington, D.C. — and among blacks, Hispanics, owners younger than 50 and military veterans. O’Donnell said small business owners are gaining renewed optimism from an array of increasingly positive economic guideposts. The nation’s unemployment rate is at post-recession lows. The Conference Board’s Consumer Confidence Index is at its highest level since December 2000. And Wall Street’s second-longest bull market celebrated its eighth anniversary in March, bolstering a wealth effect among consumers that business analysts say is likely permeating Middle America. “There’s a lot of pent-up enthusiasm among small business owners,’’ said Jim Blasingame, host of “The Small Business Advocate,” asyndicated talk radio show. 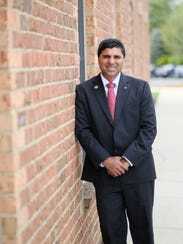 Indianapolis-based Allstate agent Ranj Puthran says his enthusiasm extends not just to his own business prospects, but also to the ways he and other small business owners can make a difference close to home. “We try to make a local impact by getting involved in the community,’’ said Puthran, who last year oversaw Allstate community grants that supported literacy and food programs in his county. Like many small business owners, Puthran says being able to support his community is a key source of satisfaction. But small businesses are not without challenges. One stress owners face today is the rising cost of goods. The Small Business Barometer’s commodities score, which measures how easily owners can obtain the goods and resources they need to run their businesses, plunged to 25 out of 100 points this year, compared to 62 in the 2016 release. And just over half (51 percent) of owners surveyed in 2017 said the costs of materials and equipment they need are higher this year than last. Even with costs taking a bite out of their budgets — or perhaps because of it — many business owners are optimistic about the prospect of lower corporate taxes and fewer business regulations. Among those surveyed for the Small Business Barometer, almost 55 percent consider the regulatory environment to be reasonable, up from 40 percent in 2015, and 18 percent think the regulatory environment has improved, up from just eight percent. “Business owners sense a change in sentiment in Washington that could boost expansion and growth while lowering their costs,’’ said Jack Mozloom, spokesman for the National Federation of Independent Business, the U.S.’s largest small business trade association. Economic headwinds and politics aside, the Small Business Barometer found owners overwhelmingly positive about their work. More than 90 percent say the benefits of owning a small business outweigh the stresses that come with long hours — whether their businesses are startups or community fixtures. Barbecue aficionado Lea Richards traded an intense job as a Wall Street financial analyst for an even more grueling schedule when she launched her Dayton, Ohio, mail-order barbecue business, Pig of the Month, in 2009. She had many 18-hour days and six-day weeks in the beginning. Through trial and error, family help and pre-holiday media publicity of her website, business began to take off in November 2011. Within a year, sales hit $750,000, and they are expected to reach about $3 million this year. Richards now employs about a dozen people to handle operations and works a relatively saner schedule. Undoubtedly, small business owners who’ve survived business cycles and their own missteps know how to roll with the punches. “I do whatever it takes to change or tweak things when the going gets tough,’’ said Veronica Hood, owner of Southfield, Michigan, clothing and accessories store Roloni’s Boutique. Hood, a 56-year-old former pharmacy technician, began her self-guided retail career after friends told her she could make money selling the costume jewelry she was making as a hobby. While the Small Business Barometer survey found that at least 56 percent of small business owners under 50 tried new business practices last year vs. at least 34 percent of those 50 and older, Hood continues to tinker with her 21-year-old store. In addition to expanding into apparel, home closet reorganizing and customer parties, she recently redesigned the store and plans to sponsor a senior women’s pageant in September. “I’m pretty clever, and that’s what helps me deal with economic ups and downs,’’ she said. Veterans are also making the most of the personal traits and collaborative experience gained in the military to make their mark as entrepreneurs, said O’Donnell, a former Marine Corps helicopter pilot. “It’s gratifying to see this particular group of entrepreneurs succeed as small business owners across the nation and make invaluable contributions to their communities,” he said. The Small Business Barometer survey found businesses owned by or that employ veterans tend to perform better on a number of metrics, both in their past performance and optimism for the future. Among veterans, 70 percent report their businesses are doing well compared to 64 percent of other small business owners. Leah Olszewski, a Major in the Army National Guard, is hoping to tap an underserved and potentially lucrative market — women who work for law enforcement and private defense contractors. She’s CEO and co-founder of startup FEMTAC, in Fort Walton Beach, Florida, which designs form-fitting clothing and tactical gear for women. Standard work clothing for law enforcement and industrial jobs is not designed with women’s physiques in mind. Olszewski aims to launch some product by mid-year, displaying the optimism that is so characteristic of America’s small business owners, whether they’ve been in the military or not. Andrew Coyne: Most small businesses go nowhere, why tilt the tax system in their favour?